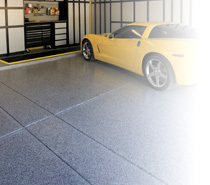 Concrete floor coatings are an excellent way to bring life back your garage, patio, basement, or any room. Polyaspartic coatings feature excellent characteristics that make it abrasion resistant, durable, UV resistant, one day install time, and car fluids that are not left uncleaned for long periods of time. Chips, flake, flek, flec, fleck, or decorative chips are also great to add to any Polyaspartic floor coating; adding excellent color and texture to your floor. We specialize in garage renovation, we offer products to suit many makeover needs. Garage Storage, cabinets, shelves, overhead, slat-wall, pavers, sealers, cleaners, degreasers, shop-vacs, stainless steel countertops, and more! To view our site directory click here, for our sitemap click here. Now serving the following and surrounding areas of: Dover, Highland Acres, Magnolia, Riverview, Frederica, Milford, Ellendale, Milton, Lewes, Georgetown, Long neck, Millsboro, Selbyville, Berlin, Greenwood, Harrington, Felton, Woodside East, Camden, Clayton, Smyrna, Middletown, Chestertown, Sudlersville, Centreville, Denton, Bear, Elkton, Delaware, Pennsylvania, Philly, Philadelphia, Wilmington, Newark, Pike Creek, Hockessin, New Castle, Salem, Claymont, Kennet Square, Oxford, Chester.